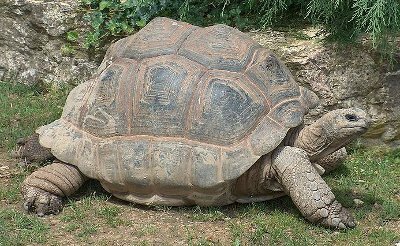 Today I want to write about a big lumbering tortoise called the Aldabra giant tortoise. These huge tortoises can grow up to 1.2 metres long and weigh up to 250 kg, making them the second largest land tortoises in the world after the Galapagos giant tortoise. The males are usually much larger than the females. They mostly eat grass, leaves and woody stems. They will also eat insects and carrion on occasions. They get most of their water from their food. The shape of their shells depends on the food that’s available. Those that live in areas where most of the food is on the ground have a shell that is more domed, whilst those that eat food that is off the ground have a more flattened shell with more room for the neck to reach up in the air. Aldabra giant tortoises are possibly the longest living of all vertebrates. They regularly live for over 150 years and some have been estimated to live for well over 200 years. At breeding time, the females lay 9-25 rubbery eggs in a shallow nest. Less than half of the eggs are fertile. As their name suggests, Aldabra giant tortoises come from the Aldabra Atoll in the Seychelles. They used to be heavily hunted for their meat, so they are still considered vulnerable to extinction. Are there any other interesting facts that you would like to share about Aldabra giant tortoises?